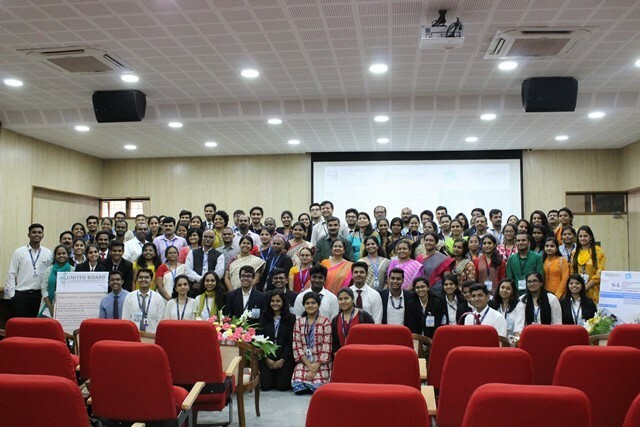 Christ University, Bengaluru, in association with the United Board and the Centre for Social Action convened the first ever National Conference on Service-Learning (NCSL 2017), in India on July 6-7, 2017 at its Bannerghatta Road Campus in Bengaluru. The conference was the first of its kind to be organized on the topic of service-learning, and witnessed stimulating and enriching discussions on perspectives, scope, applications and ways forward for the service-learning process in Indian Higher Education. Participating in the conference were academics from a number of universities & colleges such as Loyola College, Chennai; Lady Doak College, Madurai; NIRMA University, Gujarat and a number of faculties & students. Established in the year 1969, as Christ College, the university since has undertaken a number of path breaking initiatives in Indian Higher Education with the introduction of innovative and modern curricula, insistence on academic discipline, imparting of holistic education and adoption of global higher education practices with the support of creative and dedicated staff. The core values as outlined in the university’s guiding principles include social responsibility as one of the key value which guides the university functions. In line with this, the university places a key emphasis on the process of service-learning, and the academic culture at the university promotes this practice in a strategic manner across disciplines and courses of study. Service-learning at the university is more than an academic exercise; it is engrained in the culture and value system of the university in a way that students and faculties promote service-learning in various aspects of teaching and research at the university. The conference began in the morning of July 6, 2017 with an inaugural session, which witnessed dignitaries such as the honourable vice chancellor of the university, Father Thomas C Mathew, regional head of the United Board, Dr Maher Spurgeon, Dr Shalini S from NIRMA University, Ahmedabad, Gujarat & Dr Jyothi Kumar, Associate Dean, School of Business Studies & Social Sciences, Christ University. The session saw some very interesting insights shared by the speakers. 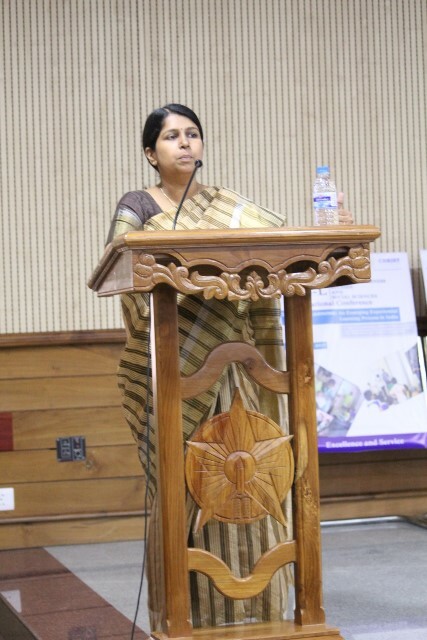 The welcome address was given by Dr Jyothi Kumar, Dean, School of Business Studies & Social Sciences, who said that service-learning was closely related to active citizenship, and Christ university remains committed to march ahead to meet its broader objectives with ‘heads held high and heart so strong’. The Vice-chancellor shared how the process of service-learning contributed towards achieving their vision & mission of the university. He emphasized the importance of life beyond universities, and the values and skills that students need when they step into the world outside. He said that ‘service-learning helps the holistic development of students, and builds their skills and capacities in a way which makes them good, responsible citizens, as they get ready to face the real world after completing their degrees. He also mentioned about how service-learning at the university transcended disciplinary boundaries, and is as much as a part of commerce/finance, computer science, English language, as it is of sociology & social work. Dr Spurgeon, regional head, United Board also gave a stimulating address on what service-learning actually is. He said that, ‘education prepares you for earning a livelihood, but is this it’s sole purpose? No, holistic education is the one which not only secures you financially, but enables you to live a life’. He further shared that, ‘learning, undoubtedly happens in the classroom, but a student tends to learn more outside the classroom. It is here, where he/she learns lifeskills, skills which make him/her a good citizen’. He was all praise for the variety of service-learning initiatives undertaken by Christ University. He also appreciated the Vice-Chancellor’s vision and upcoming efforts to introduce service-learning as a important component in the engineering programs at the university, which will enable scientific solutions from chemistry/computer labs to cross campus boundaries and get translated into societal benefits. He also said that, ‘service-learning involves functioning of a healthy mind, which can conceive the idea; a healthy heart, which drives passion; and a healthy hand, which can finally turn ideas into action’. Dr Spurgeon also emphasized on the importance of ‘curricularizing service-learning into the regular academic discourse, so that it does not remain exclusive to the regular curriculum and can contribute to the transformation of higher education in the real sense of the word. Dr Shalini S, from NIRMA University and also the guest of honour, began her keynote address by saying that the ‘service-learning process is far from being easy when it comes to implementation; and it comes with its own sets of challenges, but is immensely enriching and satisfying, if one is able to overcome the barriers’. She shared that as Higher Education is increasingly being challenged to address and resolve social issues, SL is almost becoming a permanent feature in the Indian higher education landscape. Emphasizing the true value of SL, she quoted, ‘what we do for ourselves, remains with us; what we do for others, lives with the world’. In this context, she also quoted Benjamin Franklin, who said, ‘tell me, I forget; teach me, I remember; involve me, I learn’. Prof Chitra, Dean, Department of Mathematics, Lady Doak College, gave an account of how her college and department approach service-learning in their academic curriculum. She shared that all service-learning projects/initiatives at the college are primarily based on three questions: what? So what? And, now what? These three questions guides the premise of all service-learning initiatives in the sense that it helps identify the essence of curricular teaching in the broader context of community realities; its implications and what can be done to address community needs, through application of theoretical classroom concepts. She also shared a very interesting example of how the mathematics students use statistical tools to understand and address problems in the community. Prof Gana majorly focused on the relevance of higher education in current times. She began her address by quoting, ‘what is important is to think how we are valuable, rather than how valuable we are’. She mentioned that if higher education ends up in ruins, primarily because it loses it purpose of existence. It needs to redefine its responsibilities in the society, to continue being relevant. Also, the courses offered at universities should not be based on the academic expertise present at the universities, but the needs of the community, and therefore there was a need to reflect on ‘what/how/why do we teach’. She also quoted that ‘education is a tool which helps us realize whether we love the world enough to assume its responsibility’. Dr Gana mentioned about the need for universities to become more ecological in nature, and use the practice of service-learning to prove their relevance and create passionate thinkers, by reaching out to ‘the last, the least, and the lost’. 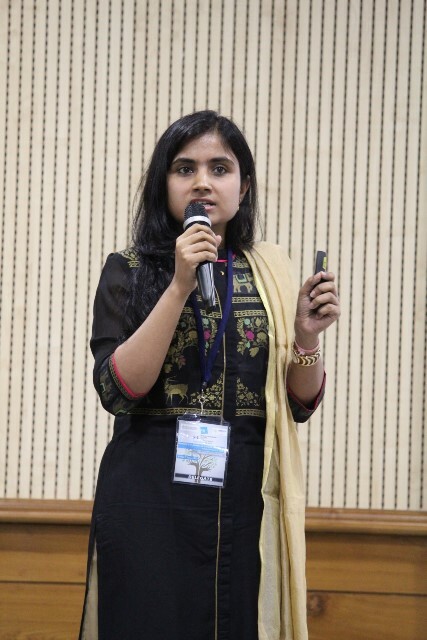 In this context, and considering the mutuality of the service-learning process, a student named Malvika from the paper presentation session, very interestingly pointed out that universities may also need to introspect that whether, they were the ones who were the ‘last, least and lost’. The second day of the conference began with a very interesting keynote by Mr Ranjit Singh, Programme Manager, Centre for Social Action (CSA) at Christ University. Mr Singh outlined the paradoxes prevailing in India, with respect to increasing GDPs, and declining HDIs. Amidst this context, he emphasized on the importance of social work, and of pursuing our responsibilities as an academic institution towards the society we live in. He also shared his experiences from the field, from the slums in Bengaluru to the Naxal affected areas in Chhattisgarh. 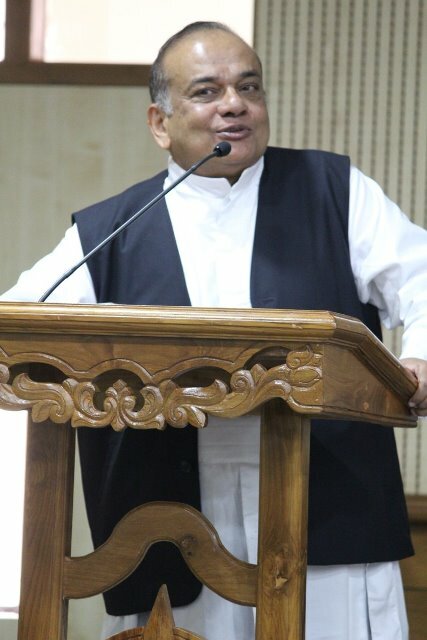 He said that service-learning as an academic pedagogy can be a useful tool for furthering social welfare objectives, and appreciated the contributions made by various disciplines at the university such as management, English, law, education, and their support to CSA for executing service-learning projects. He concluded by re-iterating the importance of the student community in strengthening the movement, and called on all academic institutions to use service-learning in a way that contributes to the increased relevance of universities in present times. Following the keynote, and after some paper presentations by students & faculties, there were experience and best practice sharing’ss from professors from various universities and how they are pursuing service-learning and making learning outcomes meet service goals. 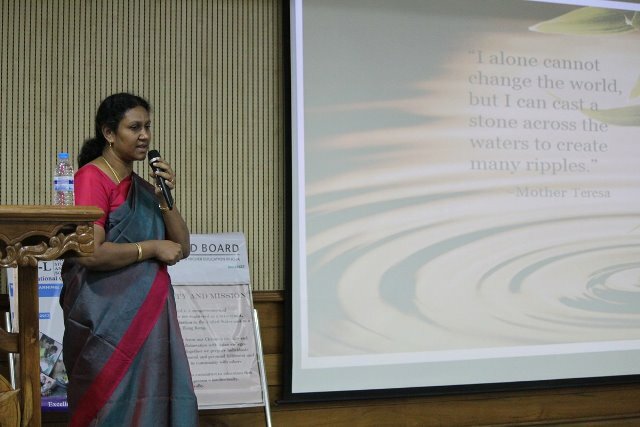 The first presentation was made by Dr Priscilla from Lady Doak College, Madurai. In the context of service-learning, Lady Doak College has emerged as an inspiration for many universities/colleges to follow. It is one of the very few colleges in India, which has institutionalized the practice of service-learning in all its academic programs ranging from Botany, Zoology, Computer Science, Commerce, Mathematics, etc. In her address, Dr Priscilla began with outlining the importance of how we assess the students, and how the focus on only marks devalues certain other critical skills that the students may be good at, including reflection, critical thinking, etc. Dr Priscilla said that service-learning gave us the opportunity to assess the students on these basic skills as well. She outlined the journey of service-learning at the college, starting from the year 1948, when the concept of ‘service’ was first visioned by the founder till at present when the college has institutionalized the practice fully, in the form of Life Frontier Education (Life). The Life program at the college is a mandatory component of the courses and is assigned six credits. 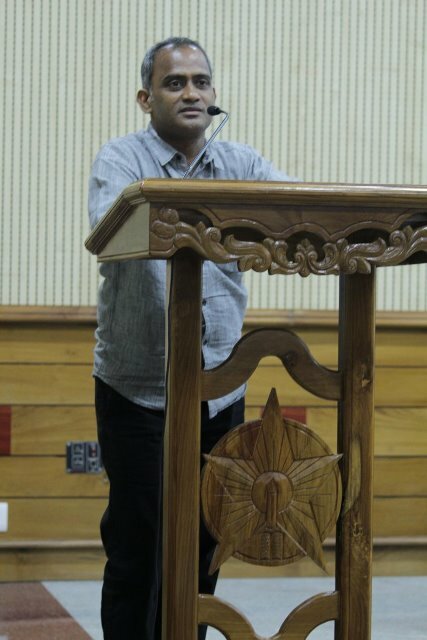 Presentations were also made by Dr Justin R Nagayan, from Union Christian College, University of Alwaye, Kerala, who shared how the practice of service-learning was being carried out at his college, which included environmental programs to rejuvenate the periyar river. 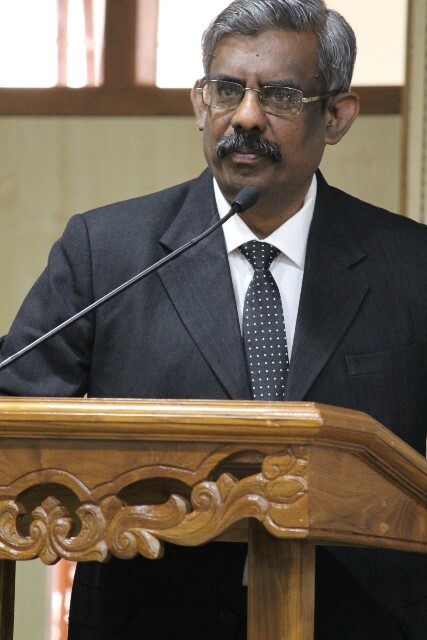 Further, Father Louiesj, Director of Service-learning at Loyola College, Chennai outlined that ‘in the present times, higher education needs a combination of intellectual capital (IC) and social capital (SC), which is essentially what service-learning offers’. He shared how Loyola college has gradually fine tuned its outreach programs into a full-fledged department of service-learning at the college in the year 2015-16. He also mentions the key strategies of service-learning as followed at the College. These were: context (IC & SC), orientation (IC), accompaniment (SC), thematic instruction (IC), institutionalization (IC), collaboration (SC) & a sense of ownership. The second day also saw some very interesting presentation on how service-learning was being practiced by various departments at Christ University such as English, Psychology, and also others like Jain University, Bengaluru. The conference closed on July 7, 2017 with a valedictory session, led by Father Louiesj and Dr Victor Paul from Christ University. The session saw passionate addresses by both the speakers who spoke about the learning’s they gathered from the two days, and appreciated the efforts of the organizers and all the participants. The vote of thanks was given by Dr Niranjan from CSA, who re-affirmed the commitment of the institution to service-learning, and to carry on the good efforts, with support from others, and partnership of other universities and colleges, with passion and heart.